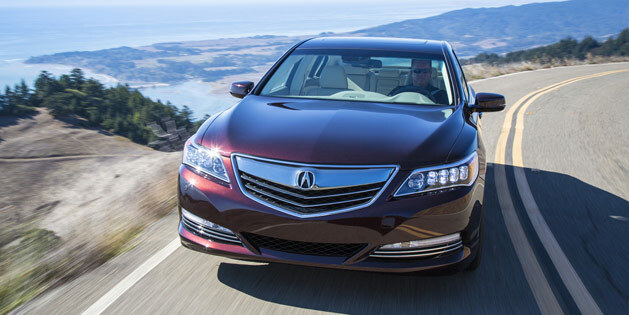 Acura has unleashed its most advanced vehicle to date with the 377 horsepower1 RLX Sport Hybrid SH-AWD now on sale. This all-new Acura flagship sedan brings to market a unique blend of exhilarating all-weather, any-road dynamic performance, V8-class acceleration and 4-cylinder fuel efficiency in a luxury performance sedan, the first vehicle of its kind with electrically powered torque vectoring all-wheel drive. Producing a combined 377 horsepower and 341 lb-ft of torque1, the RLX Sport Hybrid is powered by a direct injected 3.5-liter V6 engine and new three-motor hybrid system with the latest incarnation of Acura’s signature Super Handling All-Wheel Drive (SH-AWD) system. This unique and highly effective combination delivers powerful and efficient performance, with a 32 mpg EPA highway fuel economy rating2. RLX Sport Hybrid delivers all of this in a luxurious and comprehensively-equipped package with class-leading rear seat legroom. Priced at $59,9503 for the smartly equipped Technology Package, and $65,9503 for the Advance Package, both trim levels come equipped with luxurious, leather-trimmed interiors and state-of-the-art technology. Standard features include the Acura Head-Up display, a 7-speed dual clutch transmission (DCT) with electronic gear selector, Jewel Eye™ LED headlights and advanced, driver-assistive technologies such as Collision Mitigation Braking System™ (CMBS™), Lane Keeping Assist, and Blind Spot Information system. Customers can view, build and price the car at acura.com/RLX. The RLX Sport Hybrid’s 3.5-liter, 310-horsepower4, i-VTEC® V-6 engine with Variable Cylinder Management™ (VCM™) includes an idle-stop feature to help maximize fuel efficiency. The engine is mated to an all-new, 7-speed dual clutch transmission with built-in electric motor. In automatic mode, the transmission provides highly responsive and intuitive gear selection, including matching engine revs during downshifts; in manual mode, the Sequential SportShift paddle shifters give the driver gear selection control to make virtually seamless ratio changes. The electric SH-AWD system on the RLX Sport Hybrid eliminates the conventional drive shaft and rear differential, replacing them with two high-output 27-kilowatt electric motors. The rear motors dynamically distribute both positive (drive) and negative (regenerative braking) electric-motor torque, depending on driving conditions, and which torque vectoring assists in cornering. The system is further aided by the 35-kilowatt front electric motor that supplements engine torque to the front wheels and provides regenerative brake torque to charge the vehicle’s 260-volt lithium-ion battery pack. In front, the RLX’s double-wishbone, lower double-joint front suspension with Amplitude Reactive Dampers significantly improves handling agility, driver confidence and security, and ride sophistication. In back, the RLX’s multi-link rear suspension is optimized for a flat ride during cornering, confident turning capability, and a smooth ride in a variety of urban, highway and open road scenarios. Acura advanced technology features on the Sport Hybrid include the Acura electronic gear selector and Acura Head-Up Display System. The Acura electronic gear selector replaces the conventional, center console-mounted shift lever with an efficiently packaged push-button array that allows the driver to easily select the desired drive mode—Park, Drive and Reverse, as well as Sport and Normal driving modes. The Acura Head-Up Display System provides the driver with at-a-glance access to key driving information projected on the windshield. Display modes include Sport Hybrid system operation, turn-by-turn navigation, speedometer and compass, as well as alerts from various driver-assistive systems. The RLX Sport Hybrid SH-AWD features Acura’s signature Jewel Eye™ LED headlights, which offer outstanding light distribution and excellent down-the-road illumination performance and light characteristics. The RLX taillights utilize periphery LED illumination that is both effective and highly distinctive. The new RLX Sport Hybrid SH-AWD offers an extensive array of advanced safety, visibility and driver-assistive technologies that put the RLX on the leading edge of collision avoidance and assisted driving capability. Standard and available features include a Multi-Angle Rearview Camera, Collision Mitigation Braking System™ (CMBS™), Forward Collision Warning (FCW) and Lane Departure Warning (LDW), along with Lane Keeping Assist System (LKAS), Adaptive Cruise Control with Low-Speed Follow and Blind Spot Information (BSI) system. Utilizing Acura’s next-generation Advanced Compatibility Engineering™ (ACE™) body structure, along with seven airbags (including a driver’s knee airbag), the RLX Sport Hybrid SH-AWD is anticipated to earn top-level safety ratings, including a 5-Star NCAP Overall Vehicle Score and an IIHS “TOP SAFETY PICK+” rating, plus a GOOD rating in the IIHS small overlap front collision test. Consumer information is available at acura.com/RLX. To join the Acura community on Facebook, visit www.facebook.com/Acura. Additional media information including detailed pricing features and high-resolution photography of the Acura RLX Sport Hybrid SH-AWD is available at hondanews.com/channels/acura-automobiles-rlx. 1 Combined engine and hybrid electric motor system power and torque ratings. 2 MSRP excludes tax, license, registration, vehicle options and destination charge of $895.00. Dealer prices may vary. 3 Based on 2014 EPA fuel economy ratings. Use for comparison purposes only. Your actual mileage will vary depending on how you drive and maintain your vehicle. 4310 horsepower at 6500 rpm (SAE net).